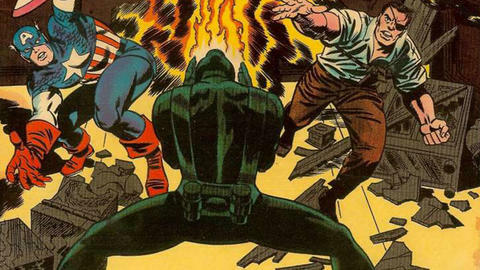 Captain America and Nick Fury team up to take on a terrorist cartel! Fury came in with a unique device he wanted Cap to look at, a miniature brain that could grow into a humanoid when added to the right combination of chemicals. He knew it had belonged to “Them,” but still hadn’t IDed the group. As the two heroes pondered the mystery, an aircraft dropped off a strange new visitor outside: a robot! The automaton changed from white to orange and then melted its way right through the walls of Avengers Mansion to confront our patriotic pals. Fury emptied his clip with no effect, but Cap knew the house’s security system better, turning on the Frigi-Defense which would drop the temperature in the room to freezing with a quickness. When even that failed to slow their pursuer down, the valiant veterans decided to take on their foe face-to-face. It easily brushed Fury’s advances off, but failed to avoid the star-spangled hero’s mighty shield. The Avenger even got the attacker on its back, but a quick dose of chemicals knocked him out. The action then cut to a mysterious super-lab filled with people wearing yellow jump suits and masks. Though readers at the time didn’t know it just yet, they’d just been introduced to those nefarious scientists in Advanced Idea Mechanics, otherwise known as A.I.M.! At the time, they remained focused on using their genius-level intellects to build an army of artificial lifeforms to do their bidding. Back at Avengers HQ, a revived Cap rejoined Fury in battle, realizing that, with its ability to mix elements, this new foe could potentially go nuclear. With the doomsday clock potentially ticking down, Nick jammed a secret pill down the robot’s mouth and Captain America landed one more powerful blow that finally felled the beast. Before their eyes, the artificial being withered into a husk of its former self. 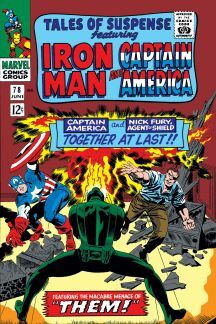 Fury then informed Steve Rogers that the Avengers had better stay out of the “Them” hunt for now and left having given the super-soldier a S.H.I.E.L.D. Priority A-1 badge!